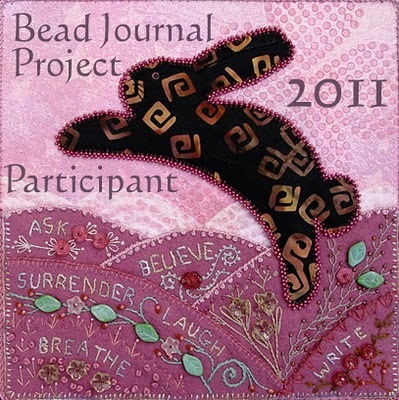 I am so happy to be involved with the Bead Journal Project again for the 4th year! This year I decided to do something quite different...I'm going to do a series of buttons which each feature a watch face, and they will probably end up being used as cabochons in a larger piece. Or I might just stitch them together into a piece without using a secondary backing. For right now, until I decide, I'm constructing them as buttons, hoping that will give me the most options for the future! In a week or so, I'll share a little tutorial with you on how these are constructed. If you've never covered buttons before, it's super easy, as you can see. They can certainly be much more elaborate than mine turned out. 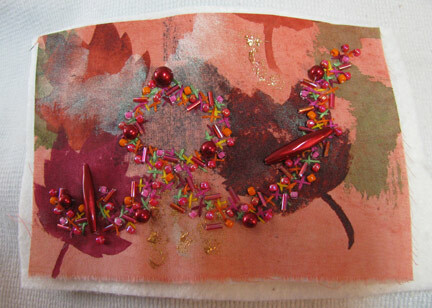 Last year I made a bead-embroidered fabric cuff bracelet each month, and the time commitment was much higher. I think it makes sense for me to alternate doing easy and harder projects each BJP season. Can you feel it? Andrew is on the verge of many big projects with limitless possibilities ahead! Lisa continues to hammer happy thoughts into wood jewelry pieces over at A Bead A Day Blog! Sign up for this fun e-course themed around "love." Perfect for the up-coming Valentine's Day holiday. Believe it or not, sometimes an Art Bead Scene editor just can't come up with the right words. Michelle reviews a "top 20" list of craft tools from Martha Stewart and compares it to what's in her own studio. Carmi creates a very soft and warm felted bead necklace. Cindy has chosen one single word to keep her creative juices flowing. What do you think it is? Bang, bang, bang! Melanie makes another Response Saturday post featuring the loud sound of texturing hammers on metal. Jean reviews Tammy Powley's amazing new book, The Complete Guide to Jewelry Making--what a thorough and terrific teaching guide and inspirational powerhouse for designers! 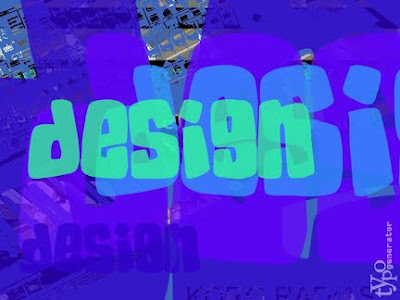 Do you want to design for yourself? Making Elegant Jewelry for Special Occasions was put together by Kalmbach Books and is full of easy classic designs that you can make very quickly but will still get lots of attention. The projects are what you would find in BeadStyle magazine, so they are very well suited to beginners or to those who would like elegance fast! Not limited to stringing, there are some wire projects, chain, and even pearl knotting. Would you like to have a copy of this book? Just leave me a comment below and you'll automatically be entered to win. If you tweet or post on Facebook or other social spots about the contest, you can leave a second comment and be entered twice! Please make sure that your link will lead me to an email address, or else I won't be able to contact you. No contact, no win, and I simply have to go on to the next person. Deadline: February 2, 2011 . And just in case your interests are broader, here's a site that lists many places where you can earn an MFA! I'm sure there are more schools and non-profit organizations that offer classes. Can you think of any to add? Leave me a comment with your suggestions and I'll add them to the list! 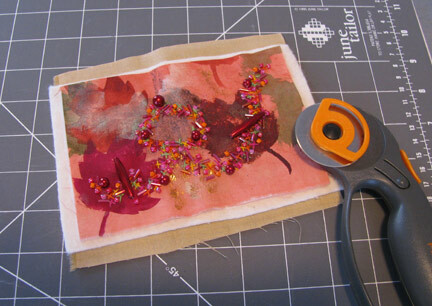 In Part One, I showed you how I go about preparing a fabric postcard (or other sized piece) for bead and thread embroidery. Today I want to explain how to finish off your piece so that the edges and back are nice looking too! 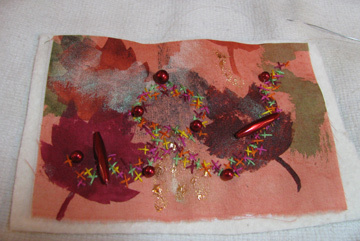 Once you are finished with all your embroidery, both threads and beads, cut all layers of your piece down to the proper size, in this case 4x6 inches. Cut a backing piece of fabric to size as well...you can just see it peeking out from under the batting in the picture above. Using embroidery thread, probably 2 to 3 strands, stitch around the edges with blanket stitch. 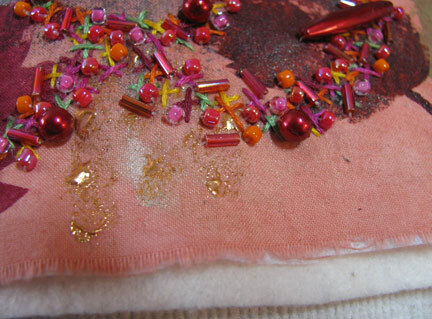 You can add beads to some or all of the stitches if you wish. Here is another piece that I finished around the same time as the one above. The winner of the book giveaway is Noemi, from beautiful Spain. She has won a copy of Metal Clay Origami Jewelry by Sara Jayne Cole! Congratulations!! This week one lucky winner will take home a beaded brooch by Cenya AND score some Soft Flex flexible beading wire! Lisa's experimenting with alphabet stamps in wood. 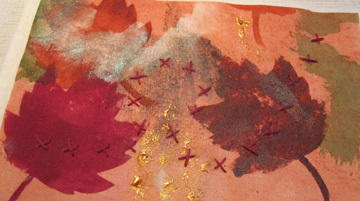 Please stop by to share your experiences with metal, wood or polymer clay stamping. What do you get when you combine yarn, crystals, and metal? A very cool double strand bracelet! If you make a mistake with a piece of jewelry, do you throw it out, start over, or try to fix it? Michelle shares a mistake she made trying to create a pendant using copper, ink, and a gloss sealant. Carmi creates a special set of felted brooches for a Canadian company. Cindy shares a surprise she received during the holidays. A simple idea for keeping the inspiration flowing. Do you belong to a bead society? It seems that we've become a society of people who shy away from joining groups. Why do you think that is? Is it because we're really so terribly busy? Or is it because the internet offers us the illusion of the group without having to venture out into the cold? I'm not sure what the exact answer is...I'm just asking what you think. So, do you or don't you? Do you think you should? Now that we're all starting to get more familiar with social media sites like Facebook, MySpace, Twitter, and the rest, I thought I'd share a list with you of some specialized sites for those who are interested in fashion. Any of these sites can become a part of your marketing strategy if you're interested in selling your jewelry. Some of them might be good for you to join and to network in...some are only really useful for researching trends. A couple of times each year, I like to "get out there" and see what's hot and where fashion is going. That doesn't mean that I always start making pieces to fit the trends - actually, I usually don't - but I still think it's a smart thing to keep on top of. Why? Because you'll have a much tougher time selling pieces that are completely out of phase with the current looks. That doesn't mean that you can't, just that you'll have to work harder to find the niches where your style will fly. For example, if everyone is buying shoulder duster length earrings, and I'm still making small button styles, I'm going to have a tougher time finding potential clients. I may still choose to make them anyway, for many possible reasons, but it's good to know the lay of the land when you make your business decisions. Don't know your dohickey from your whatchamacallit? Well, it's past time to learn. There is a specialized vocabulary for most disciplines, and jewelry making and beading are no exceptions. Here are some resources to help you get your vocabulary straight and up to date! 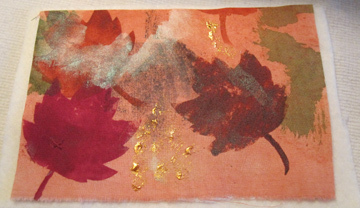 To make beaded postcards, I started with some fabric that I painted and foiled, cutting a piece to slightly bigger than 4x6 inches. I backed the fabric with fusible shirt-weight interfacing and also lightly adhered it to a piece of cotton batting. I decided on a path for the beads and embroidery to follow, and started by adding several passes of embroidered cross stitches along that path, with a different color each pass. 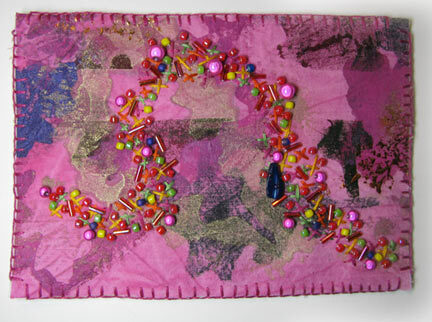 The next step was to add the largest beads, spreading them out and anchoring them well. Lorelei tries her hand at an online class to make a Wire framed Bead- a meager attempt but fun at any rate! Jean has reviewed a fascinating, beautiful book, 500 Enameled Objects. If you are curious about this form of beautiful jewelry and object crafting, check out her review! Want to win a FREE class from Beaducation? Check out this week's installment of Thursday Giveaway for your chance to win! Finally, Tammy's latest jewelry book is out on bookstore shelves! ABS announces the January monthly challenge. 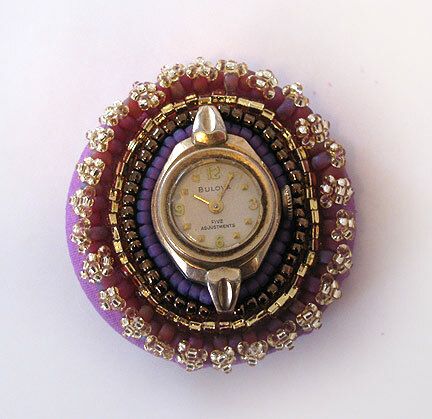 Michelle shares a list of beading and jewelry-making challenges and contests with deadlines through the end of March. Carmi turns a clasp into a necklace pendant. 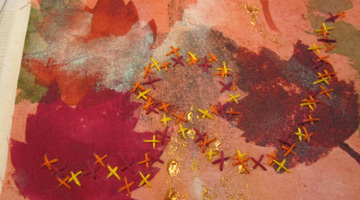 Cindy offers up a free project based on a treasure from the Sisterhood. Calling all metal-heads! Have you been wondering what was the next new thing with metal clay? How about origami? Metal Clay Origami Jewelry: 25 Contemporary Projects by Sara Jayne Cole will introduce you to an amazing combination of art forms. Using metal clay sheet, Sara introduces us to 25 gorgeous projects that will leave you gasping in awe. Metal clay sheet, says Sara, does not dry out so that you've got plenty of time to make your pieces perfect before firing them. And guess what? I've got a SIGNED COPY of this Lark Publication book to give away!! Look at those seed beads! I am particularly enamored of the gunmetal ones in the front of the picture, and I also really like the dark bronze ones. The package with the mixed colors is called granite, and I'm looking forward to using those too. The shape and size of these beads are very very regular, which is a big advantage if you wanted to use them for weaving as well as for embroidery. You know me...I never met a bead I didn't like, but some are more universally useful than others, and I'm very pleased with the quality of these. They are Miyuki's, so it shouldn't be a surprise. Thank you to Auntie's Beads for sending such a nice selection for me to work with. I use the larger size 8/0 beads pretty often, but turn to size 6/0 much less frequently. However, I had the perfect project waiting to try out the lovely silver-lined gold beads in size 6/0. My needle felted and embroidered leaf pin needed some accents, and these beads provided the finishing touch! 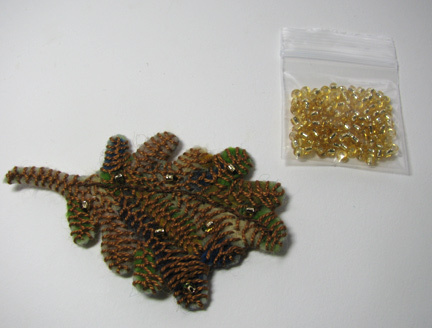 As regards FTC disclosure guidelines: I have received seed beads free of charge from Auntie's Beads in order to write a review and/or create a project free of charge for you. I have not been paid for my endorsement as it pertains to the products received. If you had it in mind to learn a new technique or two this year, but you still haven't gotten started on that goal, here's something to consider. There are lots of sites where you can buy a kit or a pattern, where you will learn in excruciating detail how to perform a certain task. Sometimes we just need it in excruciating detail, huh? 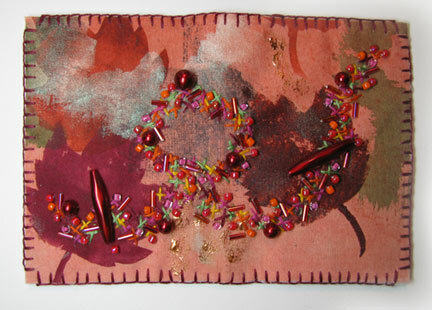 For example, my friend Dulcey Heller creates kits and patterns for a site called simply Buy the Kit. Despite the name, they also sell "bead-less kits", a clever way to refer to patterns, as well as kits that contain everything you will need, just add hands and eyes. 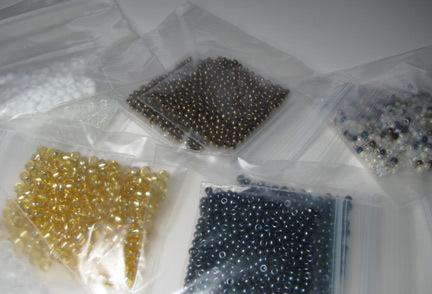 This site specializes in seed beadwork. If you are more interested in learning wire techniques, check out Jewelry Lessons. There are lessons on polymer clay and beadwork too, but wire is king (or queen) at this site owned by Eni Oken. Etsy is another place that you can check out for kits and patterns. I had the most luck by searching on the term "tutorial". This lovely shop by WireBliss is just one of the sites I found that had education for sale. 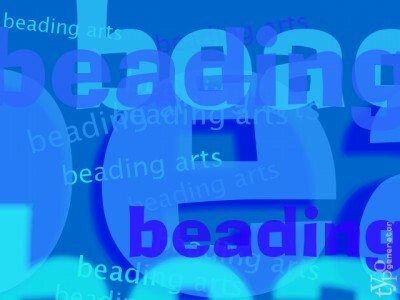 If you'd like to sink your teeth into a really big project, you might want to check out Beads East. There are free tutorials, both video and printed available here, as well as kits and patterns by artists like Laura McCabe and Sherry Serafini. JewelerMe was started by a mother and daughter team. They specifically package kits that can be done in a group setting like a bridal shower or a girls' night out. Beautiful designs can be very intimidating to someone who has never done any bead weaving before. 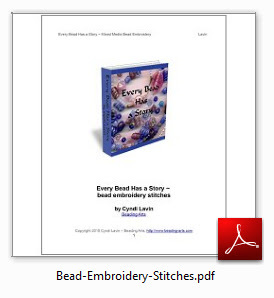 The title of this book, The Absolute Beginners Guide: Stitching Beaded Jewelry: Everything You Need to Know to Get Started by Lesley Weiss, tells you everything you need to know about it! It is about beaded jewelry that is stitched, and it does not assume that you know anything about it before you start through the book. This volume, published by Kalmbach, is definitely worth a look. Each new stitch is beautifully illustrated and photographed so that you will know exactly what to do next to master the technique. Then each stitch is folded into a stunning project, simple to do despite appearing very complicated. This would be an excellent first book for you to learn bead weaving, if that is one of your new year's resolutions! The Complete Photo Guide to Jewelry Making is my friend Tammy Powley's newest book! Tammy has a long list of books to her name already, but all I could say when I received my copy of this monster was "How the heck did she find time to sleep last year?" There are more than 700 photos in this 300 page book, and it (unbelievably) covers all major forms of jewelry making: stringing, wire, chain making, metal fabrication, soldering, metal clay, polymer clay, fiber, resin, and mixed media. Ok, a disclaimer here so that you will know that I am prejudiced, even though I really do think it's a great book. Tammy asked me to do the projects and techniques for the polymer clay and the mixed media chapters. So I can't be completely unbiased. But anyway. The format of the chapters is as follows: Each chapter begins with an overview of the materials and tools that you'll need, moves on to cover basic techniques (especially those needed for the projects which follow), and then ends with some step-by-step projects to give you a feel for that type of jewelry making. I think this is an excellent beginner book, but beyond that it would be wonderful for anyone with some prior experience who wanted to move beyond what they're already doing and delve into some new materials. In keeping with my belief in adding new materials or techniques each year, I plan to look more into the chain making chapter!